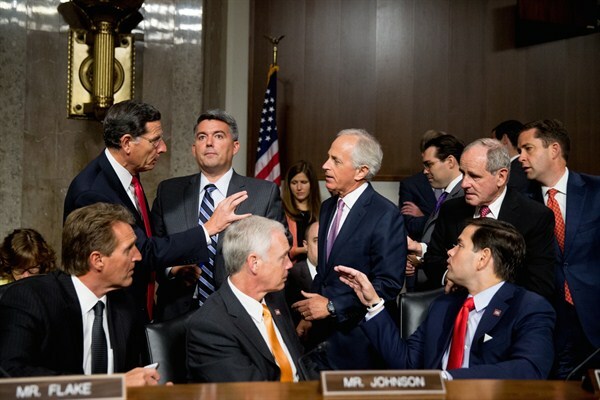 Congressmen speak together before Secretary of State John Kerry arrives to testify at a Senate Foreign Relations Committee hearing, Washington, July 23, 2015 (AP photo by Andrew Harnik). Over the next few weeks, as Congress prepares to vote on the Iran nuclear deal, the American people are going to be bombarded with arguments both for and against it. The critics will argue that the United States has given Iran carte blanche to pursue nuclear weapons and destabilize the region; the supporters will say that the deal’s opponents offer no alternative for stopping Iran’s nuclear aspirations.